Nature’s Beautiful Order From Memoria Press: Our Review | My Journeys Through Life . . . Herding Cats In New Mexico! We have recently received for the purpose of this review the curricula Nature’s Beautiful Order, from the company Memoria Press. We have reviewed products from Memoria Press before, which you can read about here. 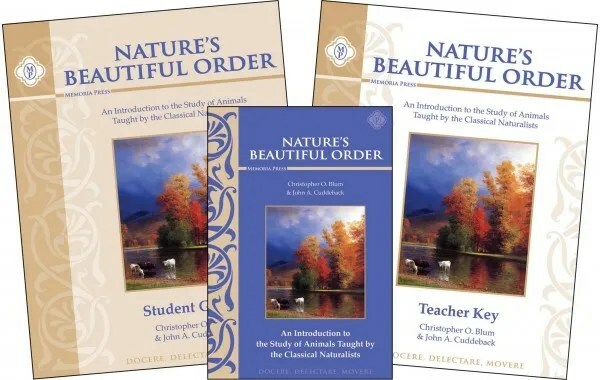 Nature’s Beautiful Order is a set which includes the text-book, student guide (workbook) and teacher guide (a copy of the student guide, but with the answers included. According to the website for this product, it is intended for grades six through nine. John James Audubon is just one of the writers whose works are presented in the text-book for Nature’s Beautiful Order. Chapter 1: What Is an Animal? I put “The Artist” on this review, because when I was reading off the possible titles, he jumped on this one. He is our “go to” guy for pretty much all things natural science, so this one really attracted him. “The Artist” is telling me that he enjoy the text-book, because the chapters read like a story as opposed to a text book. That said, he does not like the Student Guide. He says that he feels it uses too many questions he can’t understand, and that it is confusing to him. Now, to be fair, he has not had much exposure to educational material which focuses on critical thinking skills, so this is not in any way a failure of this curricula. We are not a “classical method” homeschooling family. He has agreed to work through it orally with me however, and to then write down the answers. That was his other complaint, too much writing for him, lol! As you read above, this material begins with the question of what is an animal, moving from there all the way up to man, which leads me to the one big thing that bothers me, the reference to man as an animal. I don’t believe this idea is at all Biblical, I don’t believe God would create an “animal” and say that it was created in His image. I do realize that there are many who would not agree with me, even including others within the Christian faith, but there it is. With this one exception, this is a wonderful curricula for homeschoolers. To read more reviews about Natures Beautiful Order and other products from Memoria Press, please click on the banner below.